To open the glove box, raise the handle. It houses the front passenger's airbag deactivation switch A. 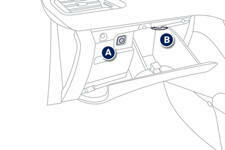 If the vehicle is fitted with air conditioning, it provides access to the ventilation nozzle B , distributing the same conditioned air as the vents in the passenger compartment. It gives access to the fusebox (see "Changing a fuse").